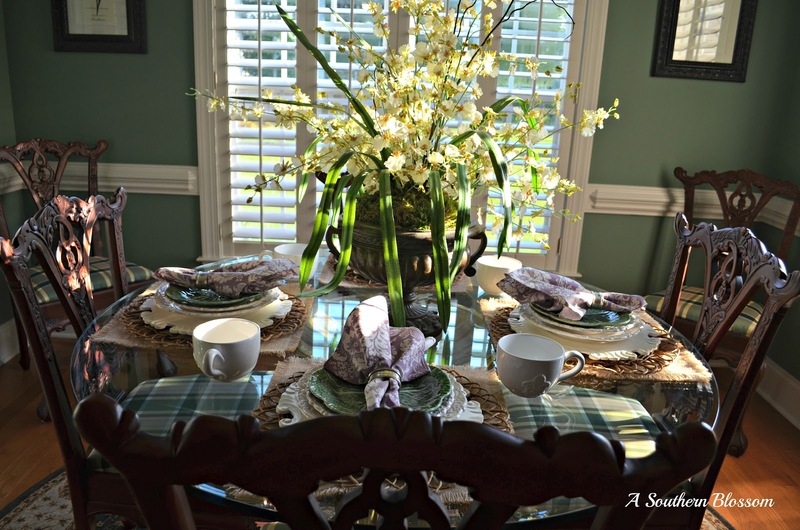 A Southern Blossom: Shall we Dine? I want to invite you over for a visit and share with you my kitchen table. Like most homes, the kitchen is the center of our home and when we have family meals this is where we gather. 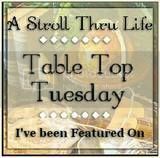 The table was given to me by my dear aunt Pam who recently went from living in a Traditional style home to a rustic log cabin and had no need of it anymore. I was most grateful to her for allowing me to have it. The table has a thick glass top with a concrete base, and seats six. The chairs have traditional ball and claw feet. The seats are covered in a plaid fabric that matched my wall color exceptionally well I might say(must have been meant for me). 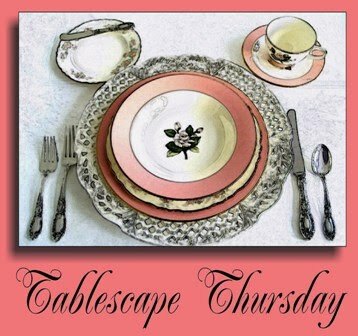 The place setting consists of a square burlap placemat, a rattan charger with a white scalloped charger atop that followed by my favorite white dishes, dinner plate and salad plate purchased from Marshalls. 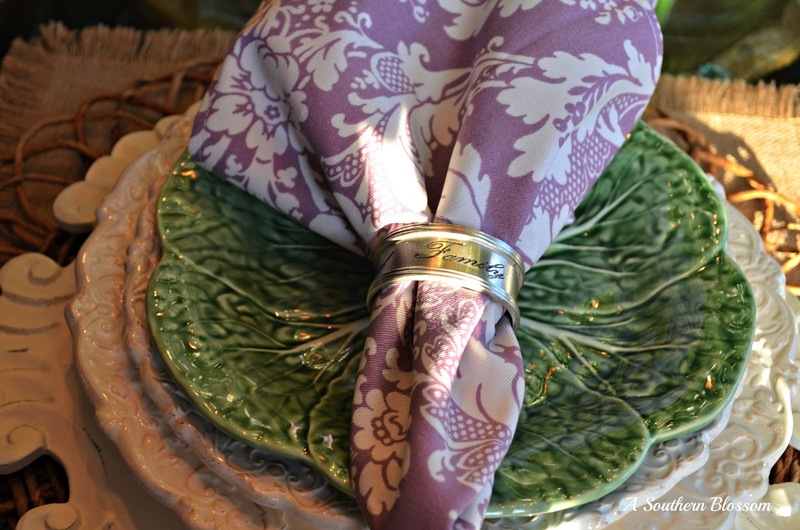 Last but not least are the Bordallo Pinheiro Cabbage plates in green. I adore these plates and I am always on the look out for more however they are most difficult to come by. On vacation I could not resist stopping by Home Goods. 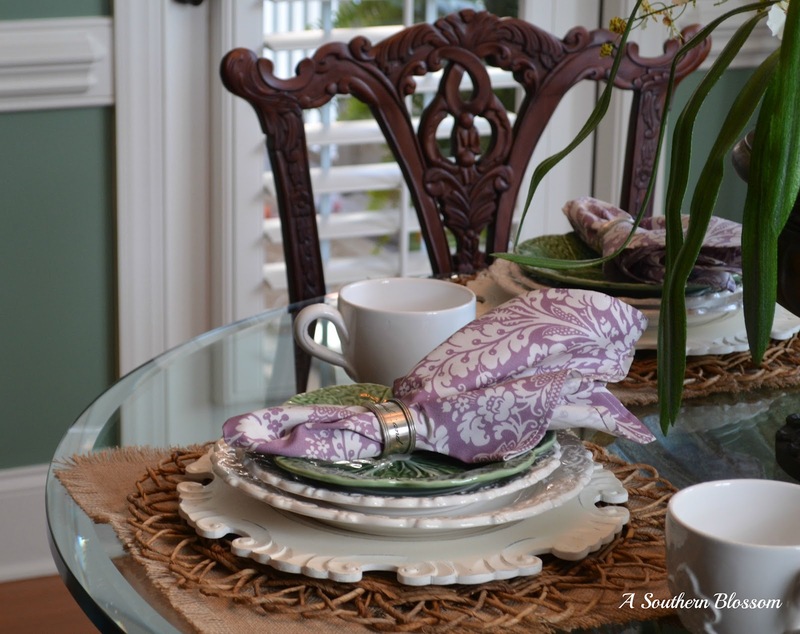 While I was there I found these purple and white napkins...score! I have a strong feeling about lavender and various shades of purple lately, I must be having a premonition! 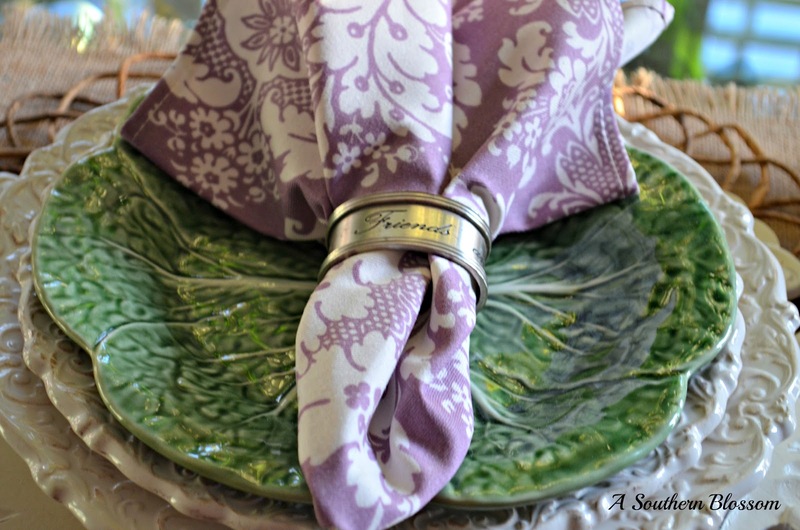 The Napkin rings are from Pottery Barn and have "friends and family" engraved on each one. The kitchen nook is surrounded by windows and gets morning sun. 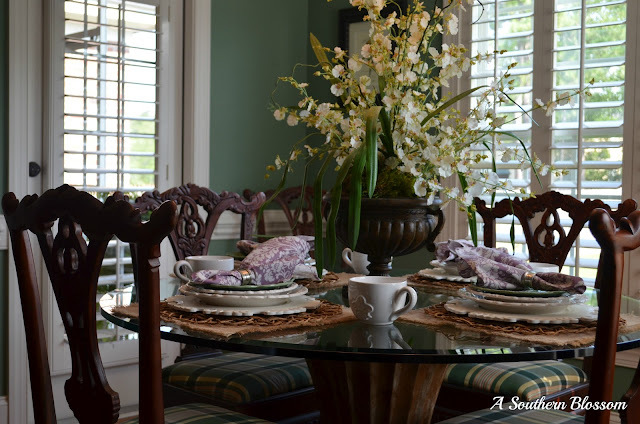 I usually keep the shutters open so sitting in this area allows you to enjoy the porch(the door to the left) and the back yard. 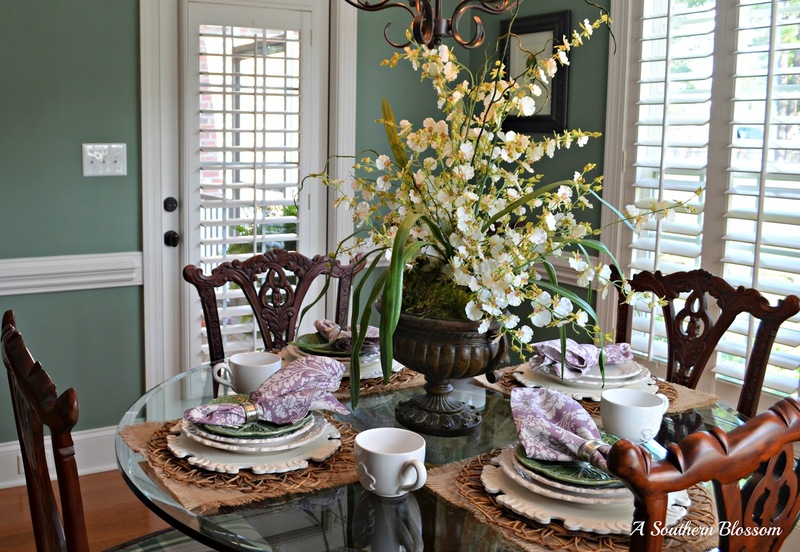 The centerpiece is a large orchid arrangement. I made it large to help feel the expansive area since we have nine foot ceilings and a lot of windows. This is the lady of the house or as I like to refer to her: the official greeter. Her apron changes with the seasons and occasionally she wears a hat, today she's wearing but what else, her pearls. 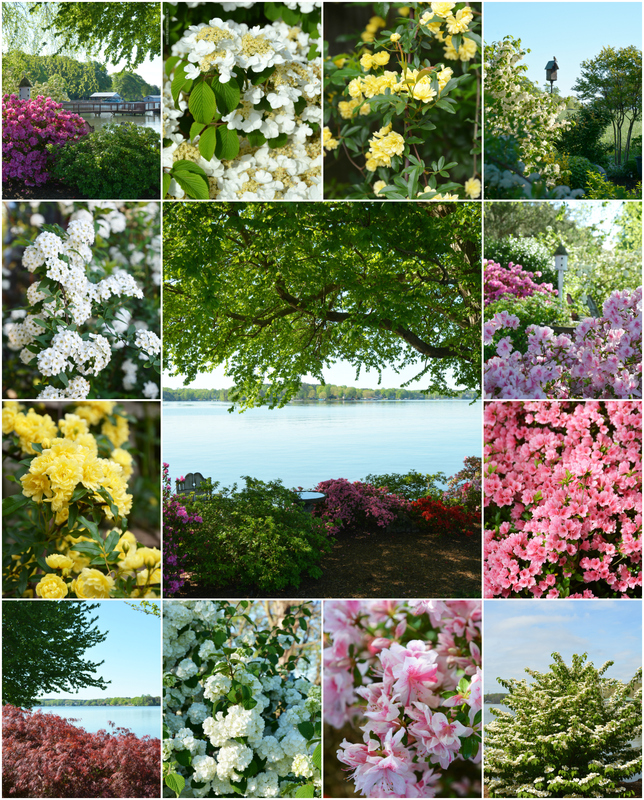 She's a true southern blossom! 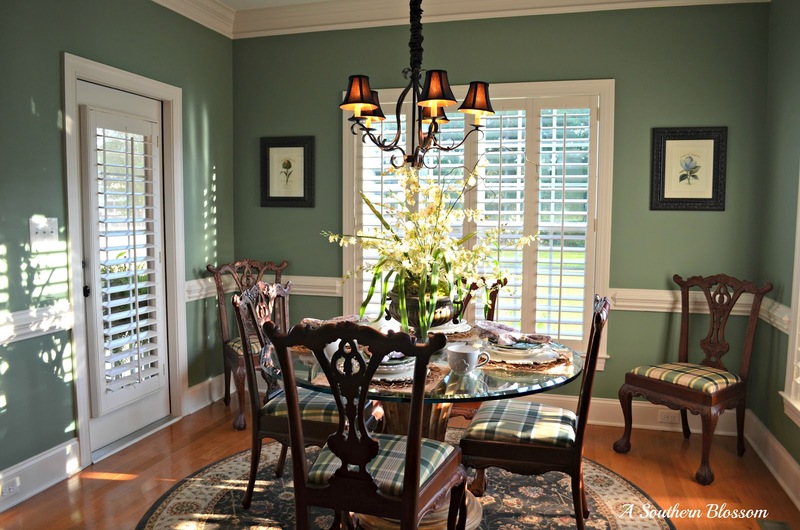 oh , what a beautiful dining room. That table and chair set is amazing. It suits the room wonderfully and you have decorated it just right. 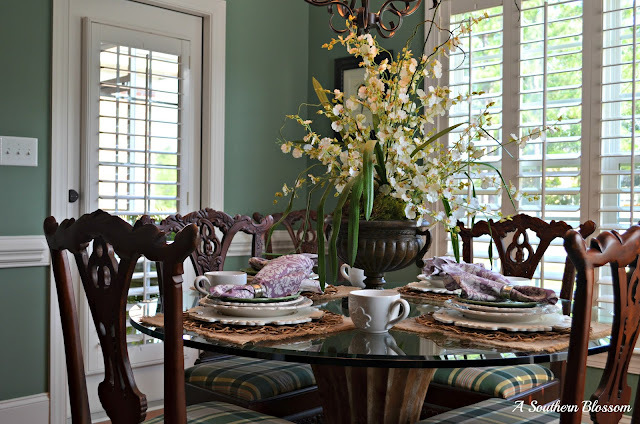 Love your breakfast room. Great wall color and of course I love the shutters. Lovely dining room. And your official greeter is lovely as well. 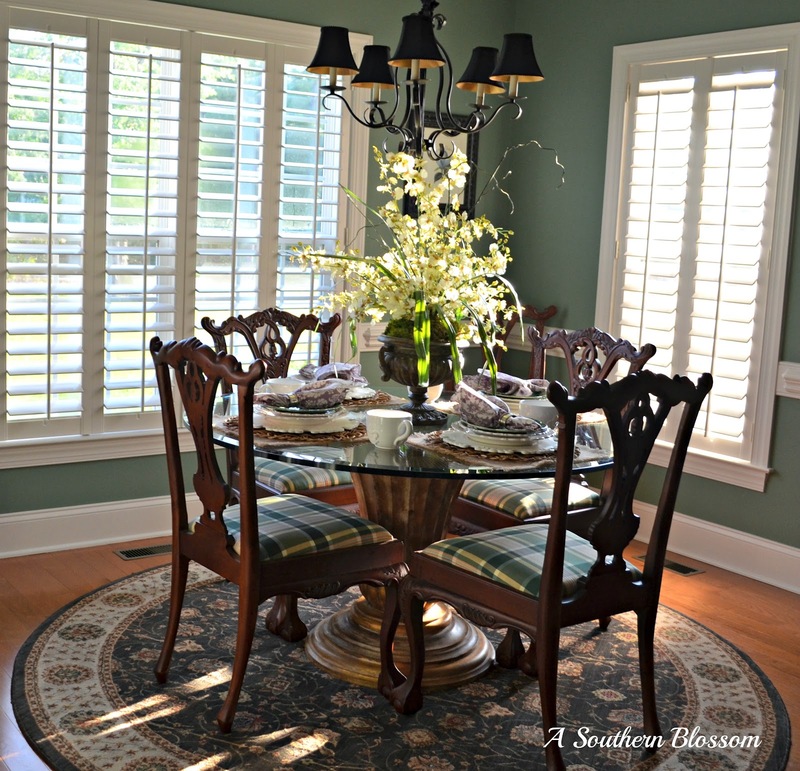 Your dining room is amazing! Would you please share the wall color? It's gorgeous! I want to cry for you. In fact, I think I feel a tear welling up...seriously. I can only imagine the horror when those plates met their fate. Yikes! I don't know if you guys have a Tuesday Morning store where you live, but there in addition to Marshall's, Home Goods, and TJ Maxx might be your best bet for replacements. Yeah, I know...they're hard to come by. Sometimes, though, you see a few of them resurface in those stores on a whim. Dang! That just breaks my heart!!! 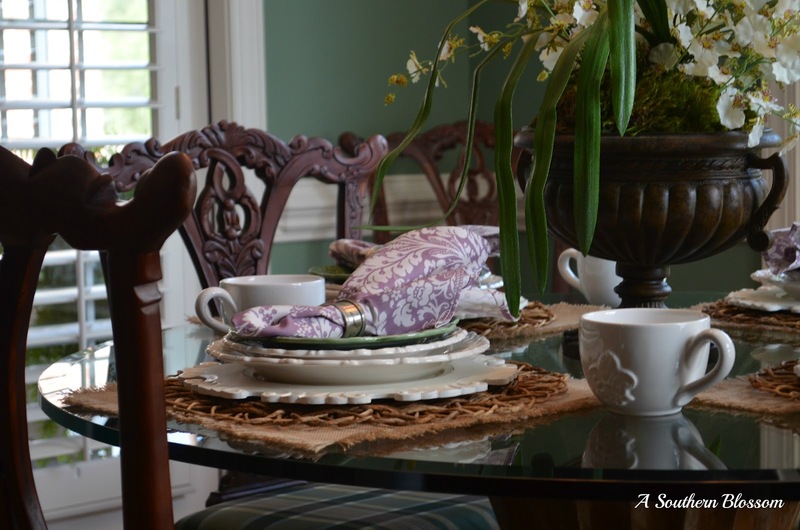 Meanwhile, you have set a lovely table on Aunt Pam's lovely gift to you. So cool for her to be living in a log cabin! 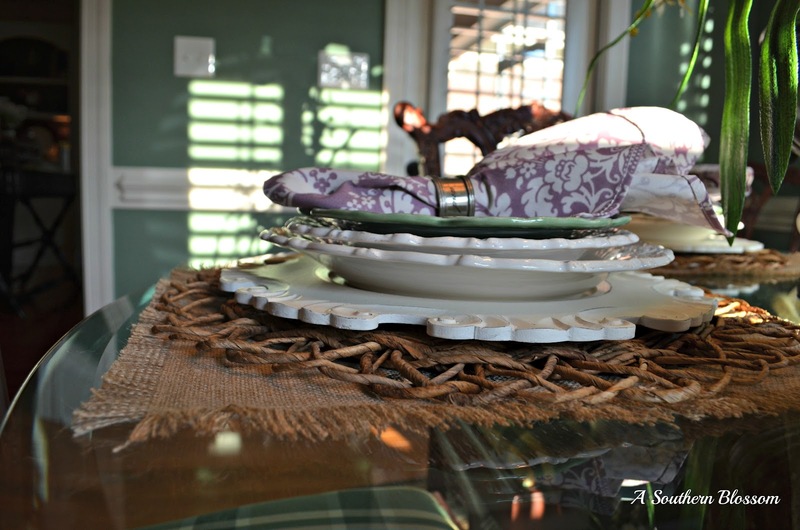 I like the way you layered the burlap placemat AND the twig one. LOTS of texture which makes any table 100 times more interesting! I love the open airiness of your eating area! Ours is surrounded by windows on 3 sides, too, but it isn't as roomy. I really am going to take a sledgehammer to something one of these days! :-) I hope you are able to find replacement plates. Have a great weekend! I have one cabbage plate/saucer type thing and I love it too. Also I love the greeter lol and I am a green lover too. I am wondering what color you used on the walls?